Sennheiser reveals special edition Pink Floyd headphones | What Hi-Fi? The special Momentum HD1 Wireless edition celebrates Sennheiser's involvement with "Their Mortal Remains". As an element of its participation in the Victoria and Albert Museum's Pink Floyd retrospective "Their Mortal Remains", headphone specialist Sennheiser is releasing a special edition of its Momentum HD1 Wireless cans. 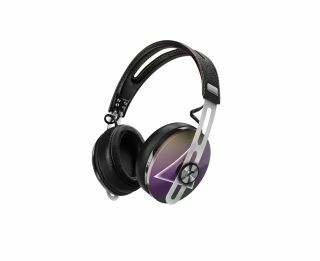 Inspired by 1973's enduring classic Dark Side of the Moon, the headphones feature rainbow-coloured stitching on the leather covering the headband, a pearlescent rainbow finish and 'prism' symbol on the earcups, and a "Their Mortal Remains" name-plate. "It is a true pleasure to mark this cultural event with a dedicated new version of Momentum that celebrates both design and an enduring love of music. This is also a wonderful way to continue our history as a company working with Pink Floyd," according to company co-CEO Daniel Sennheiser. Pink Floyd has used Sennheiser audio equipment throughout the band's career. "Their Mortal Remains" opened this week and runs for a total of 20 weeks. The special edition headphones can be ordered from Sennheiser's website and go on sale next month, priced at £380.